Blog exclusive: Sally Has Been Spayed! You read it here first folks, our Sally who is 3 years old was spayed yesterday. She had a midline spay (my preference not Sally’s although she quite likes licking her wound, so has to wear a plastic lampshade), did well during her routine procedure and recovered well from the anaesthetic to eat everything she has been offered food wise so far. We did breed registered full pedigree Bengal Cats but have opted to stop in 2013 as there are just too many cats needing homes and not enough people to commit to long term cat ownership. I have had some absolutely wonderful homes for kittens I bred but as the years have gone by quality homes have become scarce. I refused to drop our screening of new owners and many new potential owners just don’t seem committed. There was no option but to stop, as cat breeding is not a source of income more an area of expenditure like an interest or hobby often is, there’s no point breeding kittens if they have no homes or poor homes where they get dumped. We unapologetically feed our cats a holistic raw diet and although they do have occasional dry food meals (Arden Grange is my choice and theirs), Sally hasn’t had a wet food pouch for over a year now. She enjoyed demolishing a pouch of Hills I/d. What do you think are the odds cat food has horse meat in it? Horse meat may not do your cat any harm, but I am against eating horses on principle. Collection of Sally from vets was as awkward as I expected. I don’t go in to the practice advertising I have a medical degree, in fact I very often don’t go at all due to my anxiety. The cats are registered under my husband’s name as he pays the vet bills, however, I always get the distinct impression questions are not welcome, advice is prescriptive and we are scamming the vets if we find cheaper alternatives or do not feed the commercial food they are pushing on commission. Fortunately, this time, I only had one question: I had the audacity to ask what medication I was expected to feed Sally once a day for 2 days. I can read labels but I wanted to know if I was giving her a COX-2 Inhibitor. Now you’re just showing off I hear you cry! Actually, I think it’s important to know what drugs you feed your pets. I don’t think you would accept a doctor handing you pills without name and explanation for you or your child so why accept no info for your cat? As it turns out Onsior is a COX-2 Inhibitor and after reading the drug website I feel a bit better administering it. I never met the vet who operated on my Sally but he did a reasonable job. We have been spoilt in the past by vets who have gone the extra mile and glued the skin or put in dissolvable sutures. 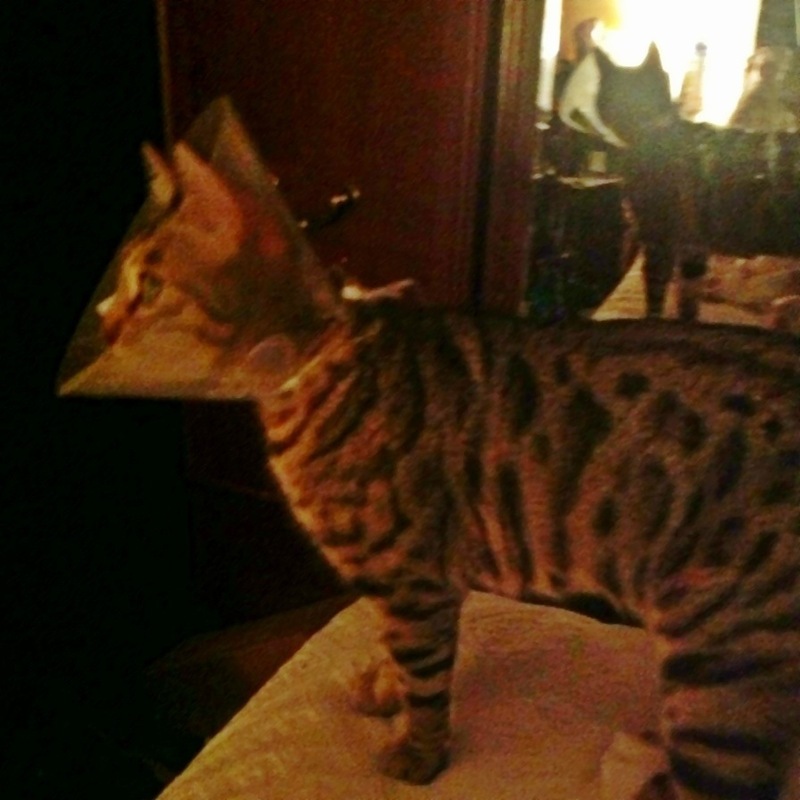 I just hope Sally gets used to her lampshade as it isn’t coming off anytime soon due to her predilection to lick her wound. Again, I feel remiss like a bad pet owner as I would never let a surgeon I have not met operate on my child, why my cat? However, on a positive note I cannot fault the aftercare, Sally has a wound check on the 4th and stitches out on 11th. I may have to do it myself as I have an appointment with the Pulmonary Vascular Unit on 11th in Sheffield which is 2 and a hall hours away and these visits may turn into an inpatient stay depending on what they find.